Three truths – religious cults are scary, indoctrinated children are scary and religious cults run by indoctrinated children are frightening! Stephen King’s short story Children of the Corn brings these truths together and the result is, well not quite as terrifying as it could be. (King’s script was rejected in favour of George Goldsmith’s script) It certainly makes for uncomfortable viewing when you consider both the implications as well as what could have lead to this situation and therein lay the terror - much like any real life incident involving children the question is always - why? 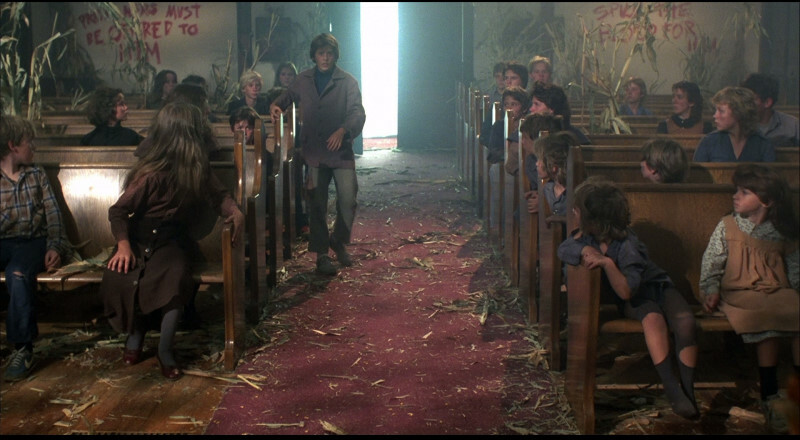 Confession time: I had never ever seen Children of the Corn so my review will not be filled the nostalgia that some films get away with. The film starts off with a very nasty massacre at a diner. It honestly and certainly watching it in an age where terrorism is in the news every single day, this was a planned attack and it’s a creepy and effective sequence. Bit by bit we learn the child preacher is a religious nutter (I know a total shock in a Stephen King adaptation - see also The Mist, Carrie) and that all the adults are dead and the children remain, sacrificing all adults that accidentally make their way through the fictional town of Gatlin. Enter Burt (Peter Horton) and Vicky (Linda Hamilton) a couple travelling through to get to Burt’s new practice, only problem is that they run over a young boy, its written like that because that seems to be the worry shown by Burt and Vicky, Vicky is quite upset, Burt almost shrugs it off but he finds out the boys has had his throat cut before they hit him, thus begins a lot of driving about trying to actually find the town of Gatlin to report the murder of the boy – who is now the boot of the car – whilst I can appreciate the effort in trying to convey the claustrophobia and panic but in all honesty, it’s corn. You could drive through it if need be. That aside the film picks up when we finally get spend some time with the two main villains, the boy preacher Issac and his religious muscle Malachi. Issac talks of ‘He Who Walks Behind The Rows’ and claims that God talks to him and that he sees things. The scenes of Isaac sermonising to very young children and them chanting kill,kill kill does bring a feeling of foreboding perhaps because we’ve all seen what religious or pseudo religious fervour does to easily lead people or people getting caught up in group mentalities. The finale starts off fairly tamely but then turns into something supernatural which kind of flies in the face of the idea that it was that the cult was just one person’s madness spreading and infecting others. It then goes full crazy with demonic voices and the like which whilst it makes for a good finale, it doesn’t make a hell of a lot of sense. Nor does the final minute and every film in the 80s penchant for one last scare. 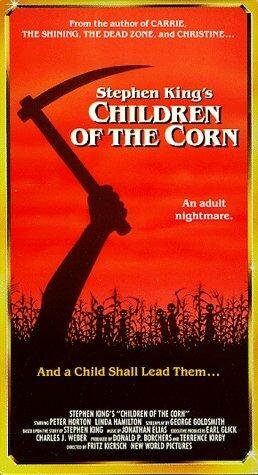 Children of the Corn is a parental nightmare, unfortunately for all the meaty subject matter the film doesn’t make anything out of it relegating it to an average horror film with a good premise.